The Epstein Barr viruses (EBV) are very common and in most cases, an infection causes no harm. However, sometimes the outcome is a serious disease. There is no effective immunization protection against EBV so far, because the pathogen is very difficult to get hold of. Scientists from the German Cancer Research Center (DKFZ) in Heidelberg have now developed a new strategy for developing a vaccine against EBV that will simultaneously prepare the immune system for different stages of the pathogen. In this way, the researchers are convinced to have made major progress towards developing a vaccine against EBV. More than 90 percent of the world population is infected with Epstein-Barr virus (EBV) – usually completely unnoticed. The virus is well adapted to the human body and the immune system keeps the virus well in check. Nevertheless, EBV is anything but harmless. Besides infectious mononucleosis (Pfeiffer's disease), the virus can also cause cancer. In addition, it is suspected to promote autoimmune diseases such as multiple sclerosis. "We therefore urgently need a vaccine against EBV," said Henri-Jacques Delecluse from the German Cancer Research Center (DKFZ). In collaboration with partners from the Munich Helmholtz Center and Heidelberg University, the research team led by Delecluse has now developed a new strategy for developing a vaccine which they hope will bring a breakthrough. The central problem in developing a protective vaccination against EBV is that the virus goes through various phases throughout its life cycle. Directly after infection, it usually remains in a latent phase where it appears to remain silent in infected B cells of the immune system, replicating together with the B cells when they divide. However, this latent phase is anything but harmless because diseases such as lymphoma can arise at this stage. When the virus reactivates from the latent phase, it progresses into the so-called lytic phase where new viral particles form and are released. EBV produces very different repertoires of viral proteins in the two phases. "Previous attempts to develop a vaccine mostly targeted a particular protein from the capsid," explains Delecluse. "However, this means that the vaccine prepares the immune system only for EBV in its lytic phase." An immune response that targets the capsid protein can only be successful if free virus particles are present in the body. Study participants who were given this type of vaccine were not protected from later infection with EBV. Vaccine attempts that were directed exclusively against proteins of the latent phase were equally unsuccessful. 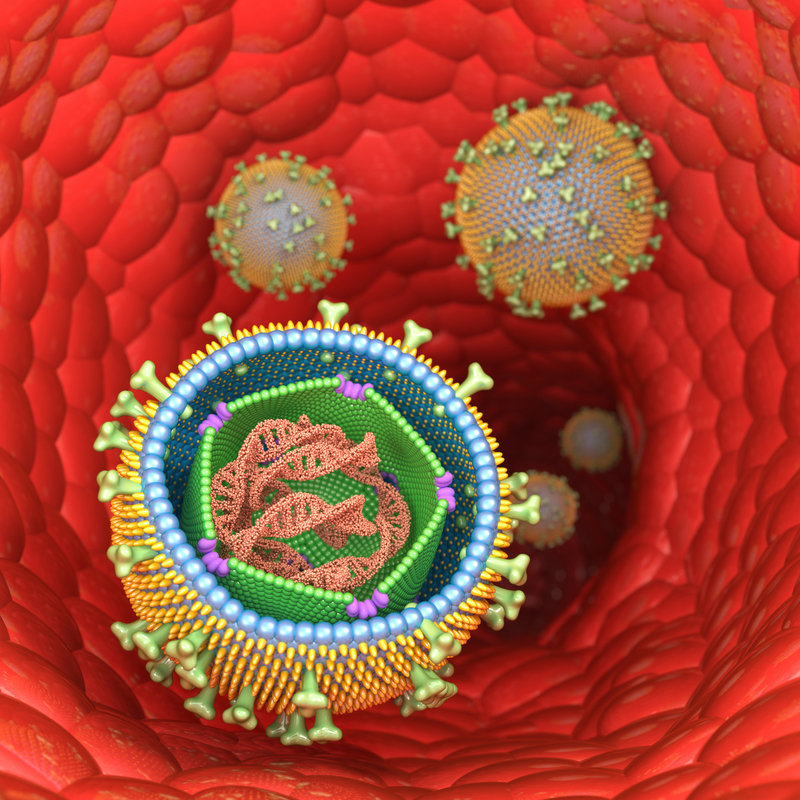 "We know that the immune response in healthy EBV-infected people is directed against proteins of both lifecycle phases," said Delecluse. "Therefore, it was obvious that we should develop a vaccine which takes this into account and also contains antigens from both phases." The basis for this vaccine are virus-like particles (VLPs), which were also used in previously developed vaccines. VLPs are empty virus shells that do not contain viral genetic material and against which the body can mount an immune response. A new approach taken by the scientists led by DKFZ's Delecluse was to additionally equip the VLPs with proteins of the latent phase. The investigators tested whether these particles were in fact capable of causing a protective effect in experiments with mice whose bone marrow had been replaced by human bone marrow. As a result, the rodents are equipped with a predominantly human immune system. When the researchers injected these animals with the VLPs loaded with two types of antigen groups, the mice developed a specific immune response with participation also of T cells, which are essential for successful defense. In addition, the animals were protected from infection with EBV. "We have demonstrated that this approach principally works for developing an EBV vaccine," Delecluse says. He adds that in a next step, this prototype EBV vaccine must be further developed and, step by step, examined for possible use in humans. Use is free of charge. The German Cancer Research Center (Deutsches Krebsforschungszentrum, DKFZ) permits one-time use in the context of reporting about the topic covered in the press release. Images have to be cited as follows: "Source: Adobe Stock/DKFZ".